Remaining 19 municipal units of the City of Prague adopted their flags between 2001-2005. In that way, the whole procedure of granting their own symbols to those self-governing parts of Prague has been completed. Only two units (Praha 2, Praha 3) could derive their new symbols from historical arms others had to create entirely new arms and flags. Some of them chose canting symbol (Březiněves – birch trees, Lipence – a linden leaf, Lysolaje – a running fox, Praha 21 – three firs, Řeporyje – a yellow flower of agrimony) or charges and colours associated with their former business – agriculture and breeding (Benice – a flail, Libuš – a goose quill). 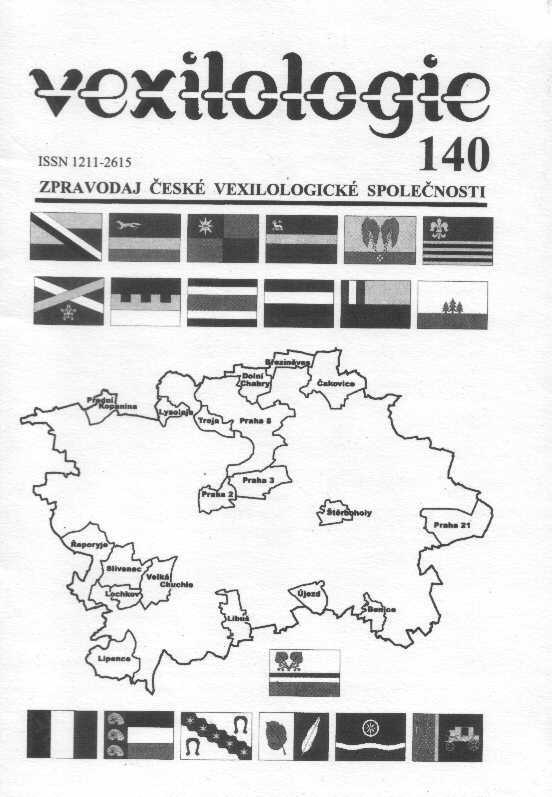 However, majority of newly adopted flags refers to the symbols of noble-owners of former domains or villages (Čakovice, Dolní Chabry, Praha 8, Slivenec, Štěrboholy, Troja, Velká Chuchle). Municipal units Lochkov and Přední Kopanina recall local natural objects in their symbolism. Until December 31st, 2005 53 of 57 municipal units of Prague displayed a municipal flag granted by the Speaker of the House of Deputies of the Parliament of the Czech Republic. Other three units adopted flags designed for them and defined in the Greater Arms of Prague (however, without an official sanction of the Parliament) and the only one unit was not concerned in this matter and did not adopt any flag; it uses the arms only. 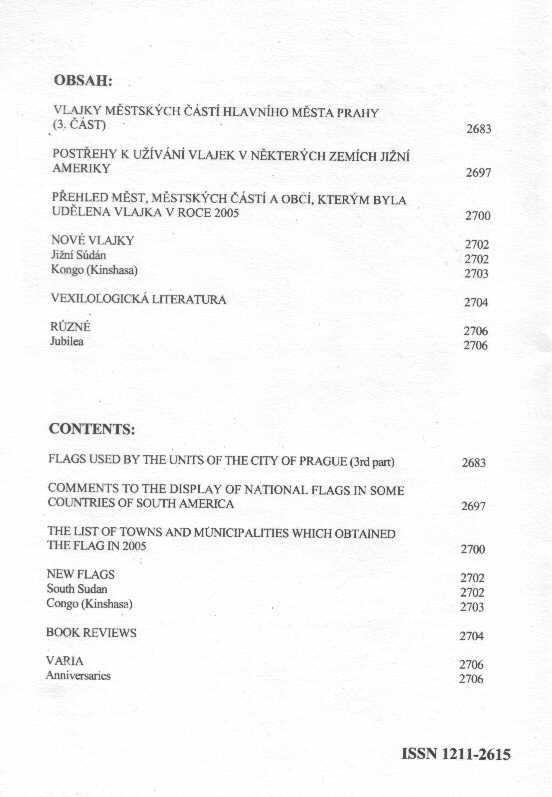 In 2000, new “The City of Prague Act” No: 128/2000 was passed that stipulates the authorization of municipal units to use their own arms and flags in Para 15. Since January 1st, 2002 seven municipal units have been renamed: Praha–Radotín to Praha 16, Praha-Řepy to Praha 17, Praha-Letňany to Praha 18, Praha-Kbely to Praha 19, Praha-Horní Počernice to Praha 20, Praha-Újezd nad Lesy to Praha 21, and Praha-Uhříněves to Praha 22. Sometimes, the lack of legal explicitness creates problems even with officially hoisted flags in some countries of South America. In Venezuela, three variants of National flag are designed for people, merchant marine and State authorities but used by them almost voluntarily. Still, there is no law stipulating National flag in Argentina, at all. Only B- shadow of two vertical stripes is generally accepted, the shape of the Sun and its face is still under question by the flag’s manufacturers. On the other hand, Uruguay adopted its law on even three national flags but the different shades of all colours used (B, Y) are widely to be seen. When the National flag of Paraguay is used to drape a coffin at a funeral, it is showing – in the contrary with funeral etiquette - its obverse in order to display the state arms. Only few differences are evident in Chile because its flag is well defined in the National flag act No. 10177 from 1912.